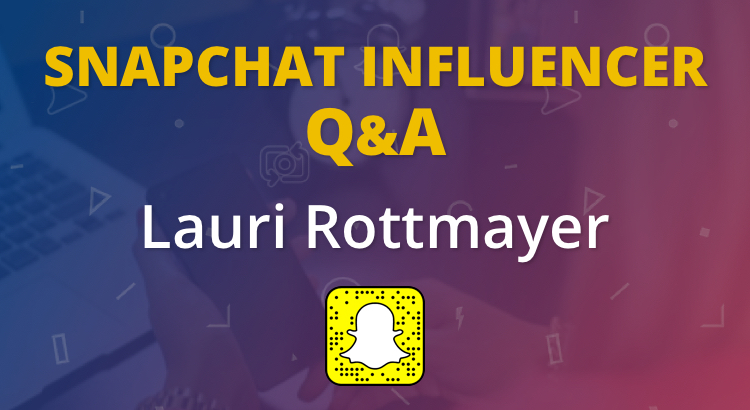 Today we are speaking to Lauri Rottmayer about Snapchat marketing, consulting and personal branding. Hi Lauri, great to meet you. Thanks for taking the time to share your knowledge with us. Could you tell us a bit about yourself and what you do? I’m a social media consultant and freelance graphic designer. I help my clients figure out which platforms will work to help them achieve their goals. I then help them create a strategy, and implement it. We work on brand awareness, website traffic, and of course, growing the bottom line. I am also a graphic designer. Although I’ve pretty much phased that out of my offerings, I do offer it to a few remaining clients. Additionally, our family owns Athletic Mission Baseball Academy. I’ve been responsible for the social media and marketing there. I’m proud to say they are mostly going it alone now. They’re doing a great job and I’m ready to set them free. I published my first book, “Pageant Savvy, Social Media For The Savvy Pageant Gal” in 2012. Now I’m finishing up my first novel. How does Snapchat tie in with your consultancy work? I offer Snapchat to my clients as I would Twitter, Facebook, or any other platform. I’m sure it’s no surprise that no one has tried it yet but I keep suggesting it. It gives such a behind the scenes “inside baseball” look at a brand that could be incredible if done right. I have been snapping for around two years now. I had downloaded the app before but didn’t know anyone else who was using it so left it alone. This time, I connected with Blake Croft (BlakeC432)and Ben Phillips @benfigo) and I was off and running. I realized after about two months how valuable it could be as a marketing tool. At that point, when I presented it, a typical response was, “Oh, I know Snapchat. That’s for seventh graders. It was frustrating and drove my desire to get everyone to understand what an effective tool it can be. When I convinced my very non-socially connected husband that we could use it to keep the public informed about his build program, I knew I had arrived. What do you Snap about most on your personal account? What effect has Snapchat had on your personal brand? On a personal level, I’m a trophy wife, powerlifter and pageant gal. 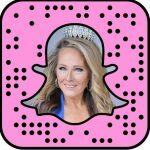 My snaps revolve around fitness, pageants (although I don’t plan to compete in another pageant for four years), and fun. I love, love, love to make people laugh. I start each day with my signature snap which is a speeded up “Good morning, Snapdragons. It’s time to carpe the java!” and the #carpejava hashtag. I did it a couple of times, then people started telling me that they looked forward to seeing that every morning. So now it’s my “thing”. Life is crazy in the Lauri Lane and you never know what’s going to come up in my daily story neither do I.
I’ve taken my Trophy Wife Renovations stories and uploaded them to YouTube so they can live on. They’re pretty funny and I didn’t want to lose them. I love to encourage people to walk at the minimum. My husband and I have been walking for 12 years now, almost every day. I’m always thrilled when someone snaps me back with a #letswalk hashtag or tells me that I inspired them to walk. It’s completely unexpected and humbling. This past year, I was Mrs. Southwest International. My platform for the pageant was concussion safety and awareness. I was surprised by the connections I made via Snapchat who wanted to help me promote my platform. Snapchat’s been great for my personal brand. My very BEST network is on Snapchat which is why I end up spending most of my social media time on that platform. If I can get my husband to understand it, I have a good feeling about the success of brands who venture into marketing on Snapchat. I’ve used it for our baseball academy and for the SM Tulsa conference, a gig I plan to reprise this March. I would suggest that a new snapchatter find a few people they know. Then they should listen to their recommendations of who they follow. There can be a lot of creepy weirdness on Snapchat and I’ve seen it all. I’m careful about who I connect with because of that. Personal recommendations are the best. I would then tell them to reach out and connect with those people. I’ve created some amazing friendships by doing that. One of my favorite things about social media is to take that virtual relationship into real life. I love how easy it is to sit down and have coffee and talk nonstop with a snap friend. Even if it’s the first time you’ve actually seen them in real life. Oh, no. There’s not only one. I love so many. These all form the base of my squad. These women have become some of my best friends and I wish we all lived on the same block. I also love JoeWilsonTV because he’s funny, JeffreyFMa because he has the most adorable little boy, and StevenBalloons because he makes some amazing balloon art. I’ve left so many out, I love them all. For me, it won’t affect Snapchat at all. If I could get my Facebook friends into Snapchat, it would be great. What could happen is that people who don’t snap but are using Facebook Live will possibly jump on it. Like they did with Instagram stories. They know Facebook and so many seem to have a hard time learning how Snapchat works. I hope that Snapchat will keep ahead of the competition with new ideas and features so they can continue to grow. I’m @LauriRottmayer in most places on social media. Rottitude on Instagram. Additionally, there are links to all of my social media homes at the top of my website at laurirottmayer.com. If I can help anyone figure out how to use Snapchat or give suggestions who to follow, I’m all in. I love connecting people and I’d love for there to be more people seeing the fabulosity of Snapchat; how many great relationships you can make, how many of your objectives you can reach via your network. I’d love for them to know that it’s so much more than the licking dog lens. Thank you Lauri for taking the time to share your knowledge and opinions. To connect with Lauri on Snapchat, scan the snapcode at the top of this article. If you enjoyed this interview, please check out more in the Snapchat Influencer series.